Learning to praise God through singing is a great dimension of Christian life. Leading others to do the same is also a great blessing. 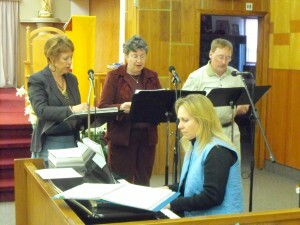 Involvement in the Music Ministry gives one the opportunity to lead the community in singing. We in St. Anne’s are so thankful to God for the wonderful music ministry. The generosity of the parishioners and the gift of talents are worth mentioning. Different teams take turn on weekend masses as scheduled by the music coordinator. Newcomers are always welcome to join any group. During Christmas and Easter season we organize a special parish choir inviting parishioners to join. The practices will be done on Tuesdays in these seasons. To join the choir for these special events, please contact Chris Mast at 780-674-2607.